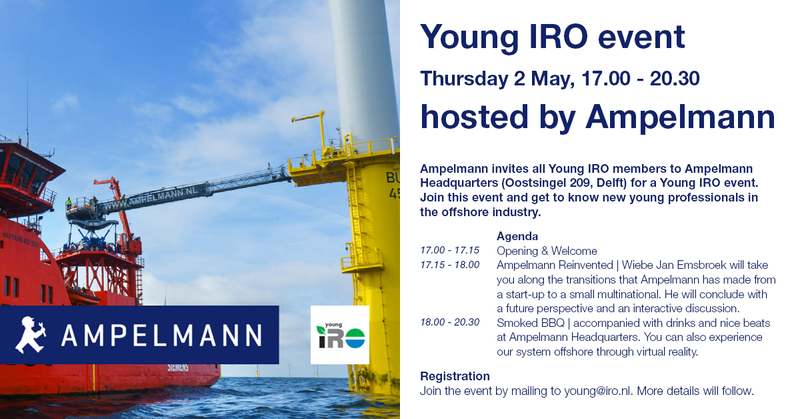 On the 2nd of May, Young IRO members are invited to a socializing event hosted by Ampelmann in Delft. Learn more about Ampelmann’s transition from a start-up to a multinational and meet other Young Professionals in the business during a BBQ and drinks. We have already received a lot of Young IRO registrations, so we have great expectations for the event. If you don’t want to miss out, please register by sending an email to young@iro.nl. Also save the date on the 13th of June! On this day Young IRO will organize a workshop about Machine Learning together with JB Systems and Innovation Booster. More information will follow shortly. In the mean time, keep an eye out for the participation of Young IRO at the Transparency House in The Hague on the 7th of May. Check out the agenda at https://transparencyhouse.com/, this event promises some interesting dialogues about sustainable entrepreneurship and consumption.